What Does Judges 3:4 Mean? They were for testing Israel, to find out if they would obey the commandments of the LORD, which He had commanded their fathers through Moses. After the death of Joshua, the children on Israel started to lose sight of their mission and responsibility and began to disobey God’s instructions. Although they had a measure of success in conquering the promised land under the leadership of Judah, they failed to obey all that the Lord had commanded through Moses and Joshua, and were finally punished for their disobedience. They soon fell into a repetitive cycle of sinful, rebellious behaviour, followed by servitude under a ruthless ruler. This led to their supplicating pleadings to Lord to save them, which God answered through providing a leader (a judge or saviour), who would rescue them from the oppression into which they had fallen. That rescuer would lead them into the path peace – for a time – until the next cycle of sinful disobedience began. It had been God’s desire to give Israel the land He had promised to Abraham, Isaac and Jacob. God told them that He would drive out all the pagan nations before them, if they would trust His promise and obey His instructions, but Israel persisted in their sinful disobedience. 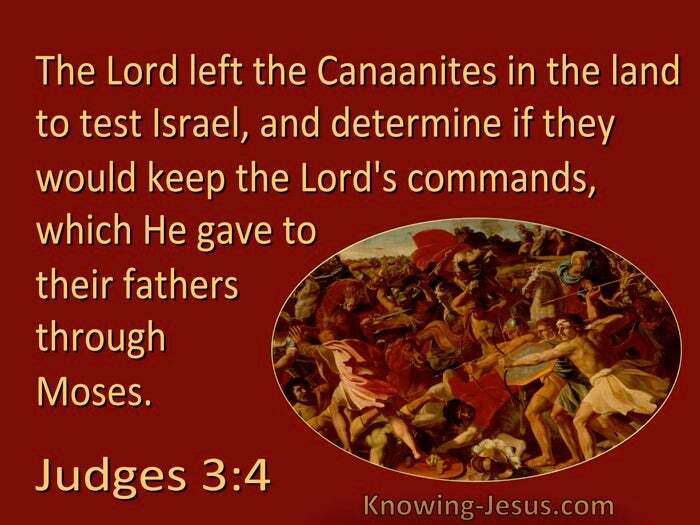 The nation rebelled against His commands, and so God allowed the remaining, unconquered Canaanites to be the chastening rod He would use to punish His people. God knew that if Israel did not completely drive out the idolatrous nations from before them, they would be an ongoing, adverse influence, which would eventually identify them as a snare, and a thorn in their flesh, and so the Lord left these nations in the land to test Israel. Sadly, they ignored the clear warning that Moses gave to them. They failed their test of faithfulness and integrity. 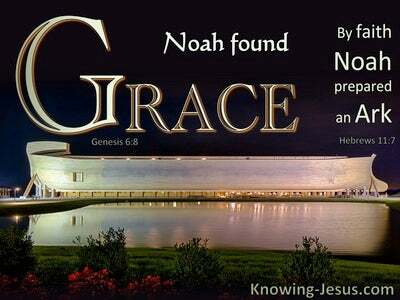 They were seduced by these ungodly people and started to live openly among them and adopt their pagan ways. They intermarried with their sons and daughters and rebelled against God’s explicit instructions. They broke their covenant, started to serve other gods, worshippe false idols and adopted pagan cultures. 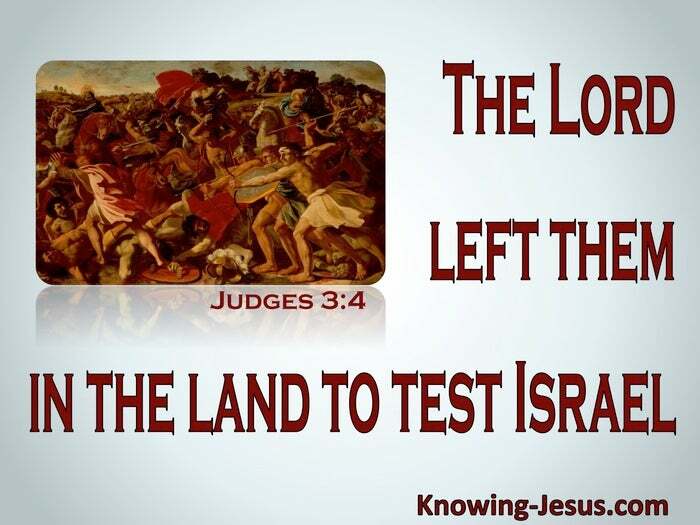 The Lord left the remaining seven nations in the land, as a test for Israel. He left these pagans in the promised land, to determine if His covenanted people would honour His name and keep the statutes, which He had made with their fathers, through Moses. 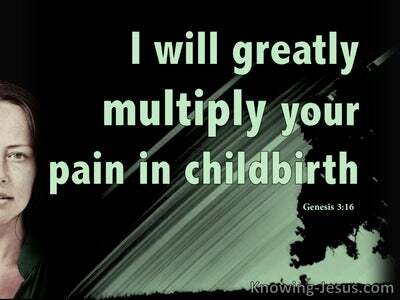 God had agreed a conditional covenant with Israel and they faithfully promised all that the Lord has said, we will do. But not many years after their declaration of devotion, they broke their word and started their cycle of rebellion, retribution, repentance and rest – until the next time. There is so much that we, in this Church dispensation, can learn from the history of Israel. The same tests that Israel faced in the physical realm, are the ones we face in the spiritual sphere. Although we do not fight against a physical enemy with spears and swords, we have an evil and seductive spiritual enemy, who is seeking to entice us away from the truth and lure us into the same sinful, rebellious behaviour that Israel displayed – by ignoring God’s word, disobeying His clear instructions and following our own foolish, fleshly desires. The adversaries we face may not be the same flesh and blood enemies, that Israel faced, but our antagonists are spiritual rulers, demonic powers, forces of darkness and spiritual wickedness in the heavenly places. Their purpose is to deflect us from the work that God desires to do through us, so that we disobey His Word and ignore His instructions. They want to infect our mind with an ungodly, temporal perspective, and to entice us into an unholy relationship with the world. They want to dilute our faith and encourage us to compromise the truth of the gospel of grace with a watered-down gospel that dishonours God and causes our testimony to be destroyed. But we are to be strong in the Lord and in the strength of His might. We are to put on the full spiritual armour of God, so that we are enabled, in the power, of His Holy Spirit, to stand steadfast against the schemes of the devil. We are to resist these demonic forces in these evil days, and to stand firm on the gospel of God. We are to clothe ourselves with CHRIST – for He is the only way, the one truth and our eternal life. He is our breastplate righteousness and our Prince of Peace. He is our belt of truth, the helmet of our salvation and He has equipped us with the sword of the Spirit, which is the inerrant Word of God – and we have the authority to enter into the throne-room of our God – for mercy to find help in time of need. May we learn all the lessons in both Old and New Testaments that God would have us learn, for greater is He that is in US, than the defeated enemy that is in the world. Heavenly Father, thank You for the many lessons that I can learn from the Old and New Testament Scriptures. 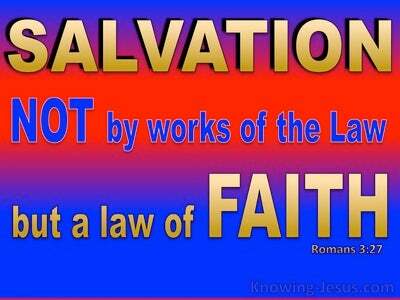 Help me not to fraternise with the enemy of my soul, but to stand firm on the gospel of God. Thank You that in the power of the Spirit I have all that I need to for life and godliness and thank You that Your grace is sufficient to enable me to come forth as pure gold, when tested by the fiery circumstances of life. Help me to keep my eyes on Jesus and not to be enticed by the seductive enemy of my soul, whose aim is to shipwreck my faith and destroy my testimony. May I never be intimidated by the evil one, knowing that Christ has already won the victory and that greater is the indwelling Holy Spirit that he that is in the world – this I ask in Jesus name, AMEN.